When we zoom in to the subimage (figure 1), the fans are seen to be pointed in the same direction, dust carried along by the prevailing wind. The fans seem to emanate from spider-like features. 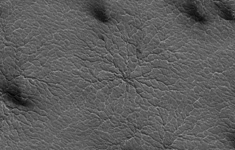 The second subimage (figure 2) zooms in to full HiRISE resolution to reveal the nature of the "spiders." The arms are channels carved in the surface, blanketed by the seasonal carbon dioxide ice. The seasonal ice, warmed from below, evaporates and the gas is carried along the channels. Wherever a weak spot is found the gas vents to the top of the seasonal ice, carrying along dust from below. The anaglyph (figure 3) of this spider shows that these channels are deep, deepening and widening as they converge. Spiders like this are often draped over the local topography and often channels get larger as they go uphill. This is consistent with a gas eroding the channels. A different channel morphology is apparent in the lanes not showing fans. In these regions the channels are dense, more like lace, and are not radially organized. The third subimage (figure 4) shows an example of "lace." 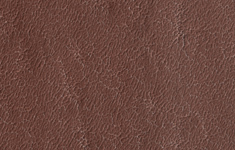 Image PSP_002532_0935 was taken by the High Resolution Imaging Science Experiment (HiRISE) camera onboard the Mars Reconnaissance Orbiter spacecraft on 09-Feb-2007. The complete image is centered at -86.4 degrees latitude, 99.1 degrees East longitude. The range to the target site was 276.1 km (172.6 miles). At this distance the image scale is 55.2 cm/pixel (with 2 x 2 binning) so objects ~166 cm across are resolved. The image shown here has been map-projected to 50 cm/pixel. The image was taken at a local Mars time of 04:27 PM and the scene is illuminated from the west with a solar incidence angle of 88 degrees, thus the sun was about 2 degrees above the horizon. At a solar longitude of 181.1 degrees, the season on Mars is Northern Autumn.